When I came home last night, Tina informed me that she had already eaten dinner and wasn't hungry. So, I went outside and started my grill planning to throw on a New York (top loin strip) steak. Looking inside my refrigerator, I tried to devise a quick side dish that would get her to come join me while I ate dinner. 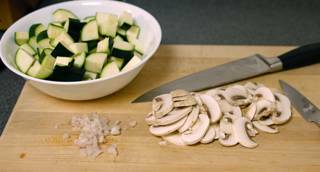 Tina loves flavorful vegetables, so when I saw the zucchini and button mushrooms, I knew I could whip up something in the time it takes my steak to cook. Zucchini, also called Italian squash, is a summer squash that is available year round. The term summer squash refers to the fact that the entire squash can be eaten (where a winter squash has a tough shell that is discarded). Many markets will sell small zucchini (four inches long) under then name "zucchini" while selling the more mature larger ones as "Italian squash". Both are the same variety, but at different maturities. The smaller zucchini tends to be more flavorful and is easier to cook. The larger zucchini have larger seeds and seed cavity. This makes it easier to over cook the zucchini into a mushy consistency. Buy zucchini that is firm to the touch (if it feels soft, that means it is deteriorating) and no more than eight inches in length. Larger zucchini may have seeds that provide an unwanted texture in your dishes (but are excellent for stuffing). Wash the zucchini with a soft brush to remove the tiny bristles on the surface (they don't bother some people, but they irritate my hands). While the grill was heating, I washed the two zucchini that I had (about eight inches in length each), chopped off the ends, and discarded them (the ends, not the squash). I then cut the zucchini lengthwise twice and chopped into quarter inch sections. I cleaned about 4 ounces of button mushrooms (cremini would probably add more flavor to the recipe, but this is what I had on hand) and sliced them. I grabbed a french shallot and minced about one tablespoon worth. After running outside and slapping my New York steak on the grill (with celery salt, table salt, and white pepper), I came back in and heated a skillet with one tablespoon olive oil. 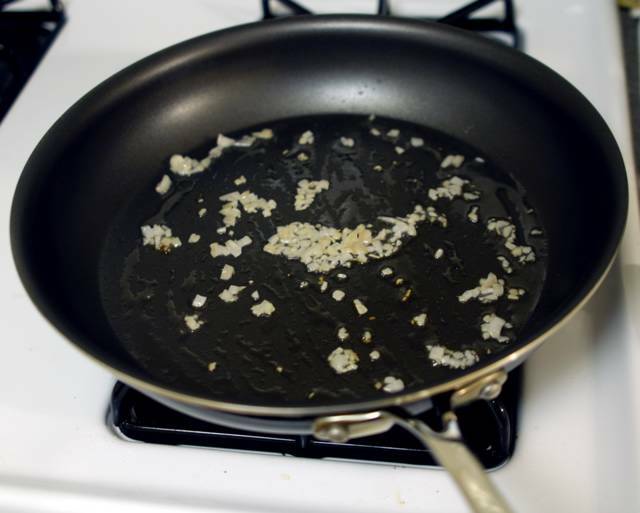 When the oil stated to shimmer, I threw in the minced shallot and kept it moving in the pan until evenly browned. Turning the heat to medium-low, I threw the sliced mushrooms on, tossed them so the oil evenly coated them, and went outside to flip the steak. Upon returning, I sprinkled a dash (two pinches or 1/8 teaspoon) of kosher salt over the mushrooms. After a few seconds, I tossed them again so the other sides would brown a little. Once a decent amount of liquid had evaporated from the mushrooms, I added the chopped squash to the pan, sprinkling on an additional dash of salt. I also went outside to move the steak to the lower heat side of my grill to finish. Turning the heat back up to medium-high, I allowed the squash to cook, tossing them every ten or fifteen seconds. (At one point, I went outside to remove the steak from the grill and let it sit for the juices to redistribute.) Once some of the zucchini picked up some brown caramelized bits, I turned off the fire and poured the vegetables into a bowl. I took the bowl, walked over to Tina, and held it close enough for her to smell. She joined me for dinner. Congratulations on being picked by google as one of the blogs they show on the blogger main page! That sounds really good. Thank you for posting such a good looking and great tasting recipe for a side dish! finally a worthwhile blog which publishes not just food for thought but also appeases my hunger. great job!! 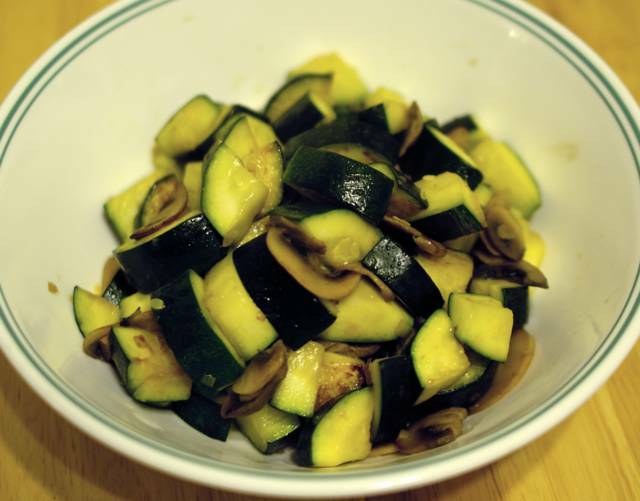 Great way to prepare zucchini/summer squash. I have also found the simplest preparations are the best way to prepare this vegetable. About the only difference that I do is julienne the zucchini, saute it in olive oil with garlic and season with salt and pepper - that's it. The next time that I saute zucchini I will use shallots and mushrooms - I still have a few dried morels left - I bet they would work great. Zucchini and mushrooms - an interesting combination, and I bet it tastes real good! The only problem I seem to notice is the ingredients. Sometimes I don't know what they are based on its (english) name. Allow me a suggestion: post more photos of the ingredients before chopping them. Thanks. Which ingredients are unclear? Let me know which ones you don't know, so I can get an idea of which ones to watch out for. I'll try to take more ingredient pictures as well. He is probably referring to simply the mushrooms and zucchini! I had the same experience going to the Asian market and trying to find Thai Eggplants (ma-keua bprawh) and "small pea eggplants" (ma-keua puang) - I had no idea what I was looking for! I made a lucky choice and got the Thai Eggplants (they weren't marked "Thai Eggplants) but couldn't find the smaller ones.. so I can see where that user is coming from, if English is not a first language "Button Mushroom" might mean as much as "ma-keua puang" does to me. Heck I don't know if I could pick a button mushroom out of a lineup myself! Thx for the recipe and I do find the pictures in general are most helpful, keep up the great work. Just reading your blog, I got a good laugh. You are such an engineer. Consider that a compliment, as I have had my ring 6 years now, too. Perhaps if I devoted a section of the site to ingredient pictures... Sort of an ingredient picture dictionary. I could go to the market and start taking pictures there - let's see if tey get mad and kick me out. Starting a food picture dictionary is a fantastic idea! Hey I like your cooking blog. A lil tip if I may. Try a robust marinade to flavor your vegetables, cut them large enough,grill them and then cut them up to the size in your pics.. I don't know how you could possibly keep up with making sure everyone, everywhere knew exactly what the ingredients are, especially vegetables and spices. Even in Americanish vs. English, let alone other languages. Though it does sound like a lot of work. But I bet people would be willing to contribute. Great blog, I love your pictures, and you cook and write like I would. When I need to look up an ingredient I usually try to STFW (search the fine(!) web) - google's define - usually like so 'define:shallot' works most of the time. smaller one have few/smaller/more tender seeds and those should work quite well in a zucchini bread. I would suggest starting a new thread / message about the problem and post the list of ingredients used for that recipe. perhaps that would shed some light on what may have gone bump in the night . . . I had a similar dish in a top restaurant just yesterday.That chef also grated parmesan cheese over it--served piping hot and cheese was melting.Delicious! As a vegetarian and chef, I love zucchini and mushrooms. I try to bring out the most flavor I can in my sauteed vegetables by way of light caramelization. I offer this technique as an alternative to soggy, bland vegetables. Start with a very hot pan and a very high flame. Add a substantial amount of vegetable oil, (Sorry, you can't use olive oil; it will burn. You can can substitute up to 20 percent of the vegetable oil with olive oil, but beyond that is pushing it. Another good alternative is clarified butter.) more than you think you'll need; the mushrooms will soak it up. Once you see very faint whisps of smoke floating out of the pan, or when a drop of water spatters loudly and evaporates quickly, add the mushrooms. Don't stir them, just let them cook for a little while (the time varies depending on the volume, but it would be measured in seconds). Check the underside of a few to see if they're browning. If so, stir them around in the pan and then let them cook undisturbed again. 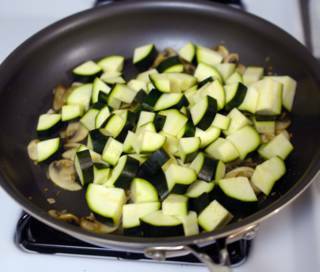 Once browning begins anew, push the mushrooms to the edges of the pan, add a little more oil if needed, and add the zucchini. Don't stir them, just let it ride. Now would be a good time to add salt and pepper, if you're into that sort of thing. Again, check the zucchini after a little while to see if the zucchini is browning. If so, add the garlic, reduce the heat to medium, and stir everything together. Continue to cook the veggies, stirring occasionally, until the zucchini is cooked al dente. It should be firm, but not raw. If I were you, I'd finish it off by blasting the heat again and hitting it with a teaspoon or so of white wine, not too much though; you want to be able to taste the vegetables, not the wine. Your recipe is very simple yet it looks so tasty. Good recipe for my vegetarian friends. I've been using this recipe for a couple of years now ... and it's AWESOME !!! My only substitution is that I use one zucchini and one summer squash for a little color variety. This vegetarian recipe is so good I think. Thanks for giving us this wonderful dish. I can't wait to try it.